73 degrees Fahrenheit is the optimal temperature for a good learning environment. However, some schools in Hawaii reach temperatures up to the 90’s, which can heavily affect the attention and concentration of the students. Fortunately, a group of our fellows saw the problem of this excessive heat and created Fahrenheit73 to tackle this issue. 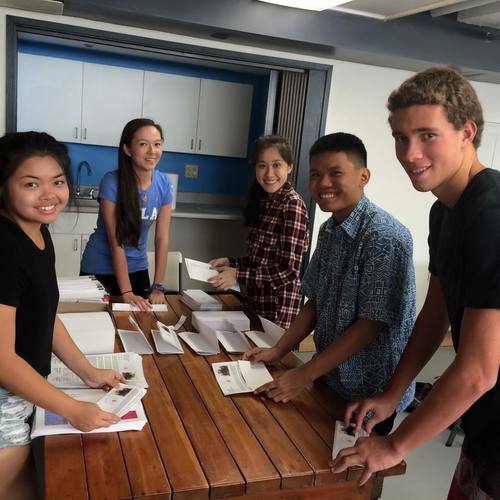 This group consisted of Eunica Escalante (Moanalua High School), Noah Faurot (Kamehameha Schools – Kapalama), Kenneth Go (Damien Memorial School), Allison Saunders (Punahou School), and Charissa Tan (Mid-Pacific Institute), all fellows from the Class of 2015. With the help of their mentor, Tiffany Quezada, Fahrenheit 73 was able to foster change and create a buzz in just one year. Through crowdfunding, these student leaders were able to raise over $20,000 for a solar air-conditioning unit to be installed at Campbell High School, which can be one of the hottest schools on Oahu. Their efforts have been noted by many, including Rick Blandigard, the general manager of Hawaii Now (KGMB and KHNL), Chris Tanaka of Hawaii News Now, and more. What inspired you to create Fahrenheit73? When we were first deciding what our project would be, we knew that we wanted to tackle something realistic, yet bigger than ourselves. At the time, media coverage was flooding with articles and stories of the high temperatures plaguing classrooms across the state. We saw an article from Civil Beat that utilized thermal cameras that revealed some classrooms reaching upwards of 100 degrees Fahrenheit. Right away, we knew that this was an issue that countless people have tried to solve and we thought what better way to solve a problem facing a multitude of students than by student themselves. This entire project was about students being able to reach out, listen to one another, and come together under a common goal. Can you explain the meaning of the name? The Council of Educational Planners Facility International cited a study that saw the impact of differences in classroom temperature affecting students’ ability to score on standardized testing. They found that students in classrooms with a temperature in the 73 degree range scored highest among their peers and showed the most improvement. Thus, Fahrenheit 73 is a testament to our belief that students should have classroom conditions conducive to learning. Our vision, simply put, is “Inspiring student led change, one degree at a time.” By installing the first two photovoltaic AC units at James Campbell High School, it’s a huge step in the right direction for helping students get what, we feel, they deserve. During your time in the fellows program, what was Fahrenheit73 able to do? Fahrenheit73 wouldn’t have been possible without CTL’s Fellows Program. We are such a diverse group of students from different high schools and backgrounds that normally wouldn’t have been possible. The Fellows Program was able to connect us with local businesses that we met during our Leadership Academy to further our initiative financially. The initial $1,000 grant we earned from Aloha United Way to cover our rewards and operational costs coupled with donations from the other local businesses was truly a blessing for us. We knew that we had a large number of people supporting us and that made us work even harder! Why do you think it is important to address the problems of "intolerable temperatures facing classrooms across the state of Hawaii"? People regard students as the future. They are the ones who will lead, shape new industries, and so much more. However, to get to that point they first need a holistic education. Classrooms should be supportive of the fact that students need certain conditions for them to be the best students that they can be. Addressing those intolerable temperatures allows students not have to worry about staying cool, but they can instead focus on what matters most - their education. Our overarching goal from this initiative was about students caring for other students. Students should be free to voice their opinions about problems facing themselves, but also able to receive assistance and help in return. Many people have tried to tackle the issue of air conditioning for public schools before and we definitely want to help produce results. Could you please explain the successes of your first project for James Campbell High School? Through our crowdfunding process, we were able to exceed our $19,000 goal with a final total of $22,000. This will allow us to install two hybrid solar/photovoltaic AC units at portable P-1 at Campbell High School. This specific AC unit is only sold by Greenpath Technologies and allows it to run without any further costs to the school. Since it is solar, the school will not have to pay for additional costs, like electricity. Our installation is slated to occur within the next month and we’re definitely excited to see the results for a classroom that once reached over 90 degrees. Now that you are all officially alumni of the Center for Tomorrow's Leaders, what are your next steps for Fahrenheit73? Our immediate next step is to ensure that these AC units get installed. We’ve come a long way and we want to make sure we follow through as best as we can. I think each of us has a dream of fully turning Fahrenheit73 into its own nonprofit and I think its something that really could be in the works for us. Fahrenheit73 would like to extend a huge mahalo to their partners Greenpath Technologies and Hawaii 3R’s for understanding the vision of their project and helping them get it to fruition. Additionally, they would like to thank their mentor Mrs. Tiffany Quezada. She believed in them and supported them every step of the way: from the drawing board all the way through installation. Our team here at the Center for Tomorrow’s Leaders is incredibly proud of our fellows for being innovative and fearless in their endeavors to help their peers at other schools in Hawaii. We continue to look forward to their future works and successes.